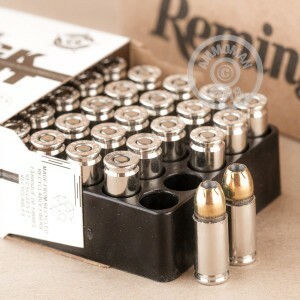 This bulk pack of 500 jacketed hollow point (JHP) rounds is great for rainy day storage or for training with the exact 9mm Luger ammunition you may need to use for duty or personal defense. 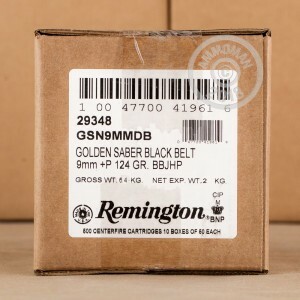 Remington's Black Belt line of ammunition, an upgrade on the well known Golden Saber round, was previously only sold to law enforcement. 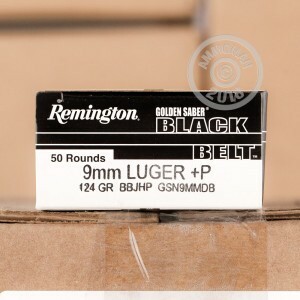 "Black Belt" is not a gimmicky marketing name but refers to the new proprietary Mechani-Lokt band which hugs the bullet where it meets the casing and locks the jacket to the lead core. This locking prevents round separation on impact and retains the weight and structure which help the bullet overcome intermediate barriers without deflection and penetrate deep into a target. As with original Golden Sabers, these rounds have a jacket made of brass which more easily withstands the high speeds of its +P rating and retains energy better at greater distances. The jackets and bullets have a full spiral cut at the hollow cavity which works with the bullet's spin from the pistol's rifling to increase the expansion rate at impact. The 124 grain weight bullet is a great medium choice for a +P round and will fit the widest range of modern 9x19mm pistols. The reloadable brass casings, which are fitted with Boxer primers, are nickel-plated for less friction during cycling as well as corrosion resistance for long-term carry or storage.